← Hear why students love practicing at Hemma! 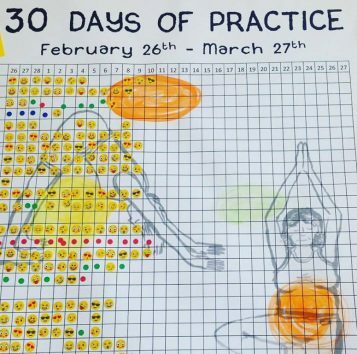 Why commit to practice for 30 days? you are making a strong commitment to yourself. You are making a choice to live in deeper connection with our body, mind, and spirit. For hemma’s yoga challenge, this may be in the form of asana (yogic postures), pranayama (breath work), meditation, mantra, kirtan, study of scriptures/wisdom teachings or any other intentional way of drawing awareness inward for unification and transformation. By devoting yourself to practice for thirty days, there is an opportunity to regain a connection to that part of yourself you yearn for; a possible realignment with the untouched places that may reside dormant within. This dedication is a radical form of self-honouring and self-love. Which can reveal a new way of being and feeling within your body, mind, and heart. It is essential to our individual success that each of us enters into such a commitment with gentle curiosity, to see what changes and awakens. Letting go of self-judgement, comparison, self-criticism, and harshness is imperative to the process. We gather together in community for support and to be held accountable for our actions. In this way we can liberate ourselves from victimhood, excuse, stories, and the mighty resistance to practice. Community support provides a container, a safe haven when we encounter uncomfortable feelings, memories, and emotions; that can live dormant beneath nervous system stimulation and in our body’s tissues. These thirty days build momentum to help each of us stay inspired along the path. It is through our dedication that the increased awareness of practice can permeate into the rest of our lives. This is living our yoga. Where we take what we learn on the mat and embody it in our relationships, work, play, and ultimately totality of life. Blessings Melody and Hemma team!